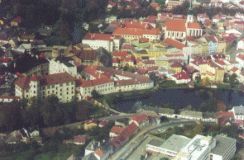 The town Jindřichův Hradec is an important centre in South Bohemia and the historical part of the town was declared to the town reserve. 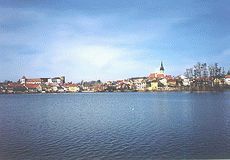 It lies around Vajgar pond on the Nežárka river about 50 km north-east of the town České Budějovice, 475 m a.s.l. There used to be a Slavonic fort in the place of the present town in the 10th century. The Romanesque-Gothic castle, first mentioned in 1220, was founded here by Jindřich I of Hradec. Originally it was called Nova Domus or Neuhaus (New House). The market village, which arose around the castle, was called Hradec (or Gradec) from 1242. In 1293 it already was a fortified town. 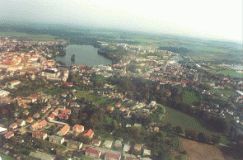 The so-called New Town, the new part which was built on the northern outskirts of the town, was added in the 15th century. The first prints (type of present newspaper) written in the Czech language were published in Hradec. The biggest progress of the town started in the 16th century. Hradec became a centre of the large domain and most of important trade routes to Austria ran through the town. Drapery, fishing, brewing and breeding sheep developed most of all. 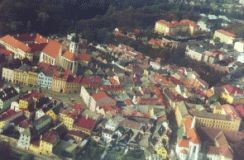 The town was reconstructed in the Renaissance style and it was the owner of the largest domain in Bohemia till the 20th century. The next owners of the town (after the Lords of Hradec) became the Slavata family in the beginning of the 17th century and then, in the beginning of the 18th century, the Černín family. After 1620 Hradec declined. The new growth came in the 18th and 19th centuries with the development of industry. A big fire in 1801 damaged the town and it also destroyed its medieval appearance. The most important sight in Jindřichův Hradec is the Gothic-Renaissance chateau, which arose from the original Gothic castle on the rock spit above the Nežárka river near Vajgar pond. Only part of the town walls with the bastions on the eastern outskirts of the historical centre and the bastion called Solnice (Salt-House) have been preserved from the fortification from the 15th century. This substituted the original fortification system from the 13th century. The town had three gateways, but only one, Nežárecká Brána (Nežárka Gate), has been preserved to this day. The Column of the Most Holy Trinity (1768) is the dominant feature of the trapezoidal square in the historical centre. A lot of Gothic houses (from the end of the 14th century) and Renaissance houses (16th century) can be seen around the square. Most of them were reconstructed after the fire in 1801 and they have some elements from later architectonic styles. The Gothic Church of the Assumption of Virgin Mary from 1370 stands north of the square. The Jesuit college with the Baroque Church of St. Mary Magdalen in its south-eastern corner are situated in the surroundings. The town museum (with the very well-known mechanical Bethlehem, probably the biggest in the world) is located in the former Jesuit seminary opposite the college. The valuable architectural sight is the Minorite monastery with the Early-Gothic Church of St. John the Baptist ,founded about 1260 not far from the square. The so-called New Town adjoins with the historical centre north of the square. The Franciscan monastery with the St. Catherine's Church from the second half of the 15th century and the Renaissance Church of the Most Holy Trinity, which was built at the end of the 16th century in the cemetery, can be found here. The old Jewish cemetery founded before 1440 lies on the south-western outskirts of the town near the Nežárka river. The narrow-gauge railway runs from Jindřichův Hradec to the small town Nová Bystřice. It is 33 km long and it was built in 1897. An important Baroque composer Adam Michna was born and lived in the town. Jindřichův Hradec is a hometown of the doctor Stanislav Prowazek, discoverer of the typhus, and historians Antonín Rezek and František Roubík. Not far from the town (about 5 km east) can be found the ruins of the Vítkův Hrádek castle.